The return of the Polish plumber, from Romania. One year ago, in the run-up to the French referendum on a proposed constitution of the European Union, much was made of the "specter" of "the Polish plumber." 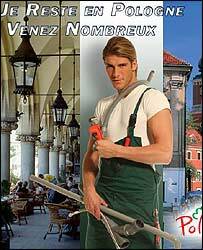 In a Europe with ever-fewer restrictions on worker movement, so the theory went, a horde of cheap Polish plumbers would descend upon France (or England, or Germany) and wreak havoc on existing wage structures. This is one reason that after the accession of the so-called A8 central and eastern European countries in 2004, only three "old E.U." nations, the U.K., Ireland, and Sweden, placed no restrictions at all on worker migration from the new E.U. members. But last week, four more, Greece, Finland, Spain and Portugal, possibly convinced by a fleet of studies opining that the economies of the U.K. and Ireland had benefited from the influx of new workers, if there was any visible effect at all, opened up their borders. Germany and Austria, which, not coincidentally, have historically been the most popular destinations for workers from eastern Europe, are still keeping a tight grip on inward migration. But this is one debate that is nowhere near from ending. Two more nations, Romania and Bulgaria, are making good progress on the various milestones needed to achieve admission into the E.U. So the whole question is being raised again. So far, there aren't any catchy phrases to sum up fear about the new arrivals -- Bulgarian bookkeepers, anyone? -- but just last week, the Institute for Public Policy Research released a study crunching the numbers of what new worker migration from those countries would mean for the U.K.
We've discussed the E.U. 's example here before, while casting a dissatisfied eye on the dynamics of immigration and labor across the Mexican-U.S. border. The question this time around is, just how are we supposed to understand worker migration in Europe from a progressive labor politics point of view? While researching "the Polish plumber" I ran across an "In These Times" article that denounced the whole European Union project as just another "neoliberal" scam. In other words, just as many progressives in the United States see both free trade and illegal immigration as a way to ensure that the owners of capital have as much access to cheap labor as they want, so too, in Europe, is the expansion of the E.U. seen as a way to undercut high-priced labor in the richer countries by tapping the ample worker resources of the new, much poorer entries. I'm not sure what to make of this. On the one hand, there is no shortage of right-wing think tank studies that see greater economic integration of the E.U. as going hand in hand with less regulation and less government "interference" with the economy. But there are also progressive think tanks that are pro-integration and pro-worker movement. The main argument for both sides is that, historically speaking, every previous expansion of the E.U. has not resulted in an overwhelming rush of workers from poor to rich countries, because the benefits of membership have helped to boost the economies of the new entrants so much that people find it more attractive to stay home. Is this really neoliberalism run amok, or a model for the rest of the world to aspire to? It's a little early to say whether all will be hunky-dory with the E.U. 's latest expansion. But there's a lot riding on how it plays out. There will be no long-term solution for problems like illegal immigration, developing-world sweatshops and the crippling of union power until there is a much greater degree of equality between the richer and poorer nations of the world. The E.U. project appears to be a fairly successful mechanism for integrating nations of greatly varying prosperity into a fair system in which all sides benefit. Imagining a similar process for the entire world is often dismissed as utopian. And certainly, it is very difficult to conceive of the United States ever participating in a system in which it had to give up some control over its own economy to a larger governing body. We don't play well with others these days. But if the U.K. can open itself up to Bulgarian bookkeepers, Romanian road workers and Polish plumbers, it seems as if we could be similarly welcoming.